Pastor Sam Gamboa Jr. and his wife Sharon have been pastoring The Good Shepherd since 2002. They received this appointment and mantle by Rev. Sam Gamboa Sr., who along with his wife Frances are the Founders, and together Pastored The Good Shepherd for 30 years. Pastor Sam Jr., grew up in the church, and at a very young age began to participate in ministry. Blessed with musical gifts, he began singing in the church as a young boy. Pastor Sam recalls "they would put a chair behind the pulpit so that I could stand on it to be seen", when he would sing solos in church. Then, he became the tambourine player for the Choir. At age eleven he graduated to playing the drums. As a teenager he began to play the piano and soon was playing during Worship and for the Choir. His first taste of the teaching ministry began at age 16, when he taught a bible study at his high school. Right out of high school, at age 18, Pastor Sam traveled the country with Evangelist Augustine Alcala. Gods' call then became more and more evident on his life. Upon returning to California, he assumed more responsibility in the church. Teaching the Youth, Sunday school, directing the Choir, playing and arranging music for Worship and preaching the Word of God. In May of 1981, Pastor Sam completed and received certification from "Faith Bible Training Center" in Torrance, California. 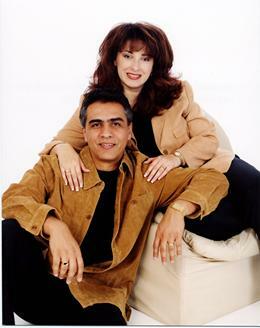 In 1992, Pastor Sam married his beautiful wife Sharon, who herself has been involved in ministry. Helping with church administration, directing the Women's ministry, singing in the Choir and helping her husband pastor a great church. Together they have three wonderful children; David, Samuel and Nicolette, and their daughter-in-law Tami and grand-daughters Bethany and Emily. As Senior Pastors, God has truly blessed them with His favor and grace to do the work of the Lord.